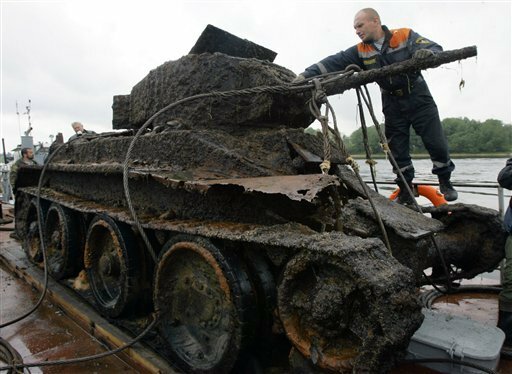 Yet another tank was recently extracted from one of the lakes near St. Petersburg. 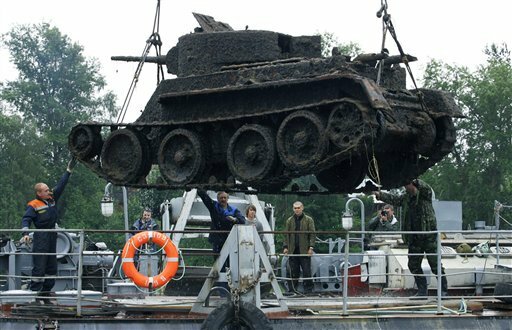 There are plenty of tanks left since WW2, each year a few of them are being pulled out by different enthusiasts. This one is particular by it’s model “BT” which was translated as “Quick Moving Tank”. It had very narrow tracks so it had to move only on good roads, and the tracks could be completely removed so that it could roll on the rubber coated inner wheels on the good surfaces when army had to relocate quickly and there were good roads available. What happened to Boris’s comment? Why did it get erased? 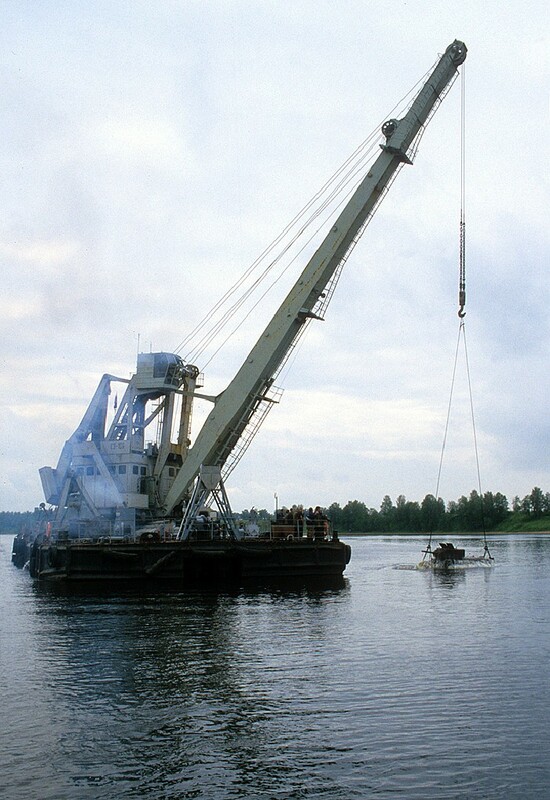 nice recovery! 🙂 will they bring it back to live? Of course its a tank. Looks like a BT-7 light tank, maybe BT-5. Hard to say, I am not an expert. Good inter-war tank introduced in 1935. Christie suspension, excellent mobility and decent firepower, lacking in armor. Design led to the T-34. Ha! “Hopefully one day a programmer”, I’ve been programming since I was 12, and even then I was better then you’ll ever be. I knew more about computers by age 16 then you will ever learn in your however many years of school. I’ve been working as a computer scientist since 18, right out of high school, and I never even graduated. And me and you are the same age, but at least I act it. Set your wirleless card on your laptop to static IP of 192.168.1.102, instead of dynamic. Another computer tip for you…. don’t use easily identifiable names on the internet, or you could be made a fool of just like you were. Last one, I’m done wasting my time one. Вах, Дарагой! Нэ сэрдыс, да!? Ти севои магуч балищой балищой евреи нос пахни сетрах-пизеда деругих, вай молодец! You are a nob and so is the fella you’re arguing with!!!!!. you win; why are you a communist though, no one in the family got killed? or what? Who said I was a communist? I’m all for freedom and democracy, but also stabilization. I just don’t think Russia should have dissolved communism so abrubtly, it would have created a lot less turmoil if it was done right. You like pictures of doodles, dont you. I imagine they are rather rare, as production stopped well before the end of the war. BT-7s were almost all destroyed in 1941, suffering from poor maintenance and crew training. Over 95,000 were produced. the most-produced tank in history. yes. russia is full of tanks. and that does not compile. people are telling me to create a method pointer but with templates it is such a mess. I haven’t written C++ code for years, sorry cant help you out there. But just curious, what compiler are you using and whats the error it spits out? Actually the T-34 was influenced by the French Char Bis and the brilliant suspension design of Christie. Teh French had invested billions in secret deals with the Reds as insurance against the lunatic Nazi leadership (predated the Ribbentropp-Molotov Non Aggression Pact). Sloped armour was not a new concept- it dates to 1920’s. The Panther III was to have it- but for typical insane reasons- Reichs Ministry of Armaments over-rode the engineers. 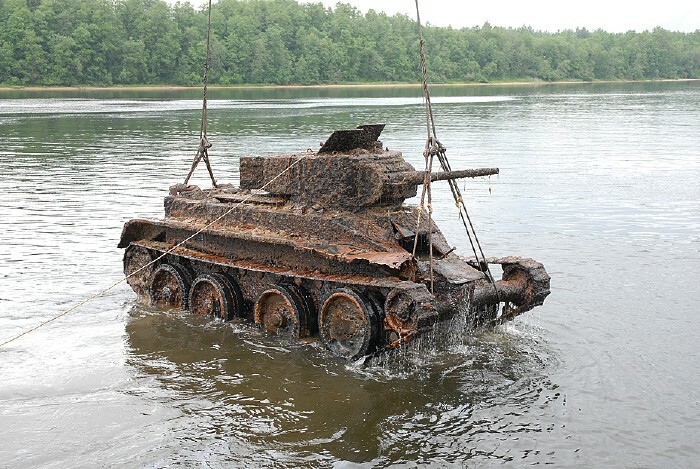 this tank is witnessed of what was happened before, it surely historical of how and when it sink in the lake….but, what will they do in that tank? for sure, it can’t be fitted in the museum. Does anyone know what types of hand tools they use in Russia? Do they make their own mechanic tools?